As we move away from the central generation supply model, the distribution portion of the grid will have to be more connected in order to manage distributed generation and storage energy resources. In most areas, the existing U.S. power grid is operated with proprietary systems that are fragmented and isolated. Attempts to create interoperable systems often fail because there is no third-party certification of conformance. One solution is neighborhood-sized mesh networks of smart meters and other devices, all communicating with radios using unlicensed spectrum, all owned and controlled by the utility in question. This approach led by Silver Spring Networks has become the technology of choice for utilities installing millions of smart meters around the United States. Silver Spring, along with companies such as Trilliant and smart meter maker Itron, has gotten utilities' attention with a technology that's cheap and reliable. What they've had to trade off on are some of the capabilities of that network, such as greater bandwidth and lower latency, that is, higher speed of communications. Another approach typified by San Francisco-based Grid Net, on the other hand, is backing WiMax, a contender for the next-generation of technology for public wireless networks. While still sparse in North America, a WiMax network could offer utilities a high-speed, high-bandwidth network, built on mass-produced, standards-based equipment, all operating on licensed spectrum that they could rent, instead of build. While WiFi is seen as too expensive and power-hungry to serve as a cost-effective communications technology for individual meters, it does make sense as an aggregation network in denser, more urban areas. Still another startup, SmartSynch Inc. in Jackson, Mississippi, has joined forces with AT&T Inc. to shoot data across that carrier’s cellular telephone network. Standards development has been fragmented in different groups across the industry due to the diversity of environments, with no formal architecture in place. Standardized interfaces for devices are lacking. In addition, there is no communications standards oversight committee to ensure compliance and certification of data sensor devices, communication network devices, and applications. Standards exist, but not always suitable. Customers in dense urban environments need different technologies than those scattered across rural islands of power delivery, and reading meters every 15 minutes or hourly is a lot different than throwing distribution grid switches on a fraction of a second's notice. 4.9 GHz Band - In 2003 the FCC assigned the 4940-4990 MHz frequency band for Public Safety use. ASHRAE SSPC 135 - American Society of Heating, Refrigerating and Air-Conditioning Engineers Standing Standard Project Committee 135 – Developed and supports BACnet - A Data Communication Protocol for Building Automation and Control Networks. BACnet is an American national standard, a European standard, a national standard in more than 30 countries, and an ISO global standard. CIM – Common Information Model – Collective definition for information exchange standards with the goals of permitting model exchanges, load flow calculation exchanges, and driving toward operation and control data exchanges. DNP3 - Distributed Network Protocol - For actual device level communications and interfaces, DNP3 is typically used now and it is expected that this will continue for some time. Most popular in North America. ICCP TASE.2 – Inter Control Center Protocol - Telecontrol Application Service Element - Has been standardized under the IEC 60870-6 specifications and allows for data exchange over WANs between a utility control center and other control centers and utilities. IEC 61850 – Object models, self-describing, high speed relaying, process bus. Originally for substation equipment monitoring, operation and control and currently being expanded. IEC 62351 - Relatively new standards for security for power systems. Security objectives include authentication of data transfer through digital signatures, ensuring only authenticated access, prevention of eavesdropping, prevention of playback and spoofing, and intrusion detection. IEC 62056 - Series provides a competing set of metering protocols. DLMS or Device Language Message Specification is the suite of standards developed and maintained by the DLMS User Association and has been co-opted by the IEC TC13 WG14 into the IEC 62056 series of standards. COSEM or Companion Specification for Energy Metering, includes a set of specifications that defines the Transport and Application Layers of the DLMS protocol. IEC TC57 WG14 - International Electrotechnical Commission, Technical Committee 57, Working Group 14 - System Interfaces for Distribution Management - Developing a series of standards (IEC 61968) that facilitate application to application (A2A) and business to business (B2B) integration for electric utilities. These standards facilitate information exchange among systems supporting business functions for planning, constructing, maintaining, and operating the electric transmission and distribution (T&D) network. – The regulatory and financial environment of the utility, including utility economics, energy infrastructure and legacy systems. Modbus – Standard in the electrical world which evolved from process automation. A serial communications protocol published by Modicon in 1979 for use with its programmable logic controllers (PLCs). It has become a de facto standard communications protocol in industry, and is now the most commonly available means of connecting industrial electronic devices. MultiSpeak –An industry-wide software standard created by (National Rural Electric Cooperative Association (NRECA) that facilitates interoperability of diverse business and automation applications used in electric utilities. Working to advance the application of information and communications systems within the electric power industry. NASPInet– A distributed architecture linking the providers of synchrophasor data (publishers) with applications (subscribers) using a publish-and-subscribe middleware and data bus concept. Currently, NASPInet architecture is at a conceptual design phase and a detailed specification is under development. OASIS - Organization for the Advancement of Structured Information Standards is a not-for-profit consortium that drives the development, convergence and adoption of open standards for the global information society. The consortium produces more Web services standards than any other organization along with standards for security, e-business, and standardization efforts in the public sector and for application-specific markets. UCAIug (UCA International User’s Group) IEC 61850 committee - composed of experts that meet semiannually to discuss how the compliance of products to IEC 61850 is demonstrated. To do that, the committee validates that the standard tests are applied in a consistent, transparent, and fair manner, thereby ensuring that conforming products meet the goals of the standard. WiMAX - A fourth generation technology that was developed in the IEEE. It is not well-deployed in the United States. It’s on a process of rolling out throughout the United States but it's quite well-deployed in other countries. And it's gaining fairly strong momentum. NIST plans to bring together IEC-TC57 WG14, WG10, IEEE SCC21 and OASIS architects to develop the framework for the amendment and extension of extend IEC 61968, IEC 61850, and IEEE 1547 to account for device profiles and discovery. Ensure that web services methods are harmonized among the candidate standards. Ensure that the standards are scalable for systems such as AMI and HAN. NIST plans to work with IEC TC57, NEMA, ASHRAE SPC 135, and OASIS to devise a common semantic model using XML Schema and XML. The objective will be to unify the models of CIM (IEC61970, IEC61968) and IEC 61850 including correspondences with ANSI C12.19 and ASHRAE 135 to form a common representation of information models constructed by these standards efforts for the Smart Grid. Latency in grid monitoring - A delay of 2 seconds or more before a grid operator sees an event is not uncommon, and this may be too late to take action to control system instability, leading to a blackout. Legacy Integration -Utilities that attempt to deploy Smart Grid applications universally across their service area must first deal with the automation they have already deployed. Most utilities have several “islands of automation” in place, developed on a project-by-project basis over the years. Automation projects have tended to be “spotty” and incomplete due to a lack of a business case, especially in the distribution environment. Now that the business environment for widespread automation is improved, system engineers must find ways to incorporate these legacy systems into the new Smart Grid. Technology Obsolesce - Many of the technologies used in legacy systems are becoming obsolete and are no longer supported. The “technology time warp” in the power industry is such that many technologies considered “advanced” by utilities are already considered to be aging and on the way out in general computing environments. Examples of such technologies are SONET, Frame Relay, 10Mbit Ethernet, trunked radio and even leased telephone lines. Many older technologies, such as Bell 202 modems, are now essentially only found in utility automation. Smart Grid deployments must find a way to either integrate or replace these systems. Enterprise application integration. This area represents a particular interoperability weak spot because the current state of the art is an extremely manual, labor-intensive process that is very dependent on the utility’s existing information infrastructure and the utility’s business practices. IP Bandwidth Requirements - Difficult to deploy Internet Protocols. Must solve the cost/range/speed/reliability puzzle. Lack of Common Definitions - There is a clear need for developing a common semantic representation for distribution assets, equipment, interfaces, and characteristics. This would include building a semantic bridge between the two most widely implemented standard data models -- MultiSpeak and IEC 61968 CIM. Advanced standards for field equipment automation are proposed, but lack designs and implementations that use these standards. Accuracy & Timeliness - Utility managers need an architecture that provides access to a universal set of timely data, and visibility of system operations of the entire organization. Accuracy and timeliness depend not just on which database the data is drawn from, but when that database was refreshed and so on. Without such a management system, utility management has what one utility executive has described as “ten thousand versions of the truth.” At any particular point in time, a utility manager in an energy control center must ask, “What is real, right now?” With inadequate, incomplete, and/or out-of-date information, the definition of reality becomes skewed and highly subjective. At a minimum, management decisions that rely on a subjective interpretation of reality lose effectiveness, with risks escalating from there. Common Library of Definitions that is used across all Smart Grid systems and use cases. Model Driven Approach that improves human understanding of Smart Grid domains and links human readable models with implementations. Internet Protocols where applicable and practical. Capable of running on any conceivable IP network (i.e., wired networks such as fiber and Ethernet, or wireless networks such as 3G, Wi-Fi, WiMAX, or LTE). Low Latency - Capable of operating at near real-time speeds -- at 100 milliseconds or less. Instant communication will be needed to support the functionality of an advanced smart grid. Interoperability - Support all electric devices (e.g., transformers, feeders, switches, capacitor banks, meters, inverters) from any vendor, because utilities are unlikely to settle for a reduced set of options when it comes to finding the right devices and applications to run their grids. Testing Framework - A robust, accepted conformity testing framework to allow stakeholders to test products for compliance with a particular standard with a reference implementation to test the standard as it is being developed. Affordabilty - It has to be economically competitive on a total cost of ownership basis: it must be more affordable than a dedicated multi-network solution it intends to replace and offer the lowest total cost of ownership (TCO). Develop a Common Semantic Model – - The two major standards players in this area, the IEC 61968/61970 CIM standards and MultiSpeak, approach these problems from different directions. The CIM standards do not attempt to provide plug-and-play interoperability, but instead define a “tool kit” that can be used to develop a set of essentially new protocols. An analogy for this process is that CIM defines a common set of words, but utilities must create their own rules for creating sentences from these words. One utility’s implementation cannot talk to that of another utility if they have not worked together from the start of the project to define the same rules. MultiSpeak developed for and by smaller co-op utilities with no resources to develop their own protocols, takes the opposite approach. It rigidly defines an interface in a very clear manner but this interface does not take into account the possible variations of information infrastructure at the utility. Although it provides interoperability between vendors very quickly, its feature set is limited and not easy to expand. The solution to these problems of course lies somewhere between these two extremes, and both technologies will likely converge. However, the problem is time. Working Group 14 of IEC TC57 has developed a roadmap for development of the IEC 61968 CIM to support distribution smart grid applications. This includes implementing a CIM profile for MultiSpeak. Accelerating this development will permit interoperability between a wide variety of smart grid applications that require access to common data and information and will also provide interoperability between MultiSpeak- and CIM-compliant applications. Such interoperation will make it easier for electric utilities to leverage investment in enterprise applications. Develop Interoperability Standards for the IEC 61970 CIM - Common Information Model . The CIM for transmission (IEC 61970) does not specify formats or messaging methods for exchanging CIM information, thereby requiring each implementation to develop their own formats and messaging requirements. The IEC 61970 CIM for transmission is strictly an abstract model with no standardized mechanism for mapping the information model to communication formats and messages, thus making different implementation not interoperable. If CIM format and messaging standards were developed, then CIM implementations could be interoperable. Revise and update parts of IEC 61968 Common Information Model (CIM) for distribution. CIM for distribution has recently developed some messaging schemes for exchanging CIM information interoperably. However, earlier parts of IEC 61968 do not yet have interoperable messaging schemes. The IEC 61968 CIM for distribution is currently not usable except for the very latest part (Part 9), since the messaging schemes and the CIM model were not well enough defined to allow vendors to implement them. However, if these older parts are revised, then interoperability of the messages may be achieved. These revisions are in the IEC TC57 WG14 roadmap, but will need significant effort to achieve. Expand IEC 61968 CIM for DER and PHEV. Although IEC 61850-7-420 for DER has been completed (with more DER models still pending, including PHEV), no CIM models for any DER or PHEV have yet been developed. IEC 61850 is designed for field communications, while CIM is for enterprise communications. 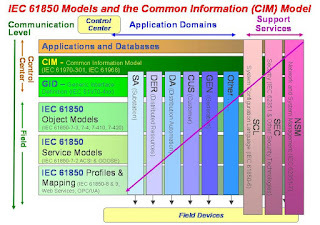 Therefore, CIM models need to carry the 61850 models of DER into the enterprise. Expand MultiSpeak. MultiSpeak, developed by NRECA and very successfully implemented for many smaller utilities, is being expanded as version 4, with more updates to come. MultiSpeak meets the requirements of the smaller utilities very effectively, but needs to be expanded to meet additional requirements for more functionality, more flexibility, more use of information modeling techniques, and more compatibility with IEC 61968. Extend and Integrate DNP3 - In the short term, standardized approaches for network management, cyber security, and managing point lists using DNP3 are needed. This would essentially apply some of the important principles of IEC 61850 to DNP3 applications. In the longer term, migration to IEC 61850 for distribution management applications will require a number of important extensions and developments. Harmonize IEC 61850, and ANSI C12.19 and C12.22, which will be published soon. Extend IEC 61850 between substations. Some protective relaying and certain other functions require communications between substations, for which 61850 should be used. IEC 61850 is designed to be used within substations. However, functions such as protective relaying need to communicate between substations. The same protocol should be used for this function. Extend IEC 61850 from the substation to the control center. Since the data in the substation uses the 61850 information model, this data should be reported to the control center using the same information model. IEC 61850 models all the equipment and functions in the substation. If those models could be brought back to the control center, then this same powerful information model would be used for SCADA and other applications, thus minimizing translations and expensive and data maintenance activities that sometimes lead to insecure and/or unsafe situations. Extend IEC 61850 to distribution automation. This is under development but does not have the impetus to move forward quickly. IEC 61850 is an information model, so it is widely seen as the best approach to communications with field equipment. Given that premise, the information model needs to be expanded into additional areas, including distribution automation. Extend IEC 61850 for more Distributed Energy Resource (DER) equipment. Currently IEC 61850-7-420 for DER covers wind (actually IEC 62400-25), photovoltaic systems, fuel cells, diesel generators, batteries, and combined heat and power (CHP). Needs extension to PHEV, additional storage devices, microturbines, gas turbines, etc. Develop an IEC 61850-lite, in which the information models can be mapped to a protocol with less overhead than the current MMS-based mapping. Distribution automation and DER devices may have only narrowband communications channels or limited data exchanges due to data costs if telecommunication providers are providing the communication channels. In addition, some inexpensive devices may not want or need to implement the full IEC 61850 capabilities, in order to minimize compute constraints or development costs. Develop Testing - Develop neutral hosted vendor interoperability testing to demonstrate interoperability based on the CIM profiles. Ensure that requirements developed by groups such as UCAIug AMI-ENT are included. Ensure that profiles account for capabilities inherent in both. DLMS User Association - (Device Language Message Specification) Maintains a liaison since 2002 with IEC TC 13 WG 14, the standardization body responsible for establishing standards for electricity meter data exchange. The User Association provides registration and maintenance services for the IEC 62056 DLMS / COSEM standards suite, performs pre-standardization work. In addition, the DLMS UA operates the conformance testing scheme. The DLMS/COSEM standard suite (IEC 62056 /EN 13757-1) is the most widely accepted international standard for utility meter data exchange. This global acceptance is clearly demonstrated by the continued fast growth of the membership, now exceeding 150, and an increase in the number of meter types certified to be DLMS / COSEM compliant. Green Energy Corp. Denver, Colorado - Provides products and software engineering services to utility, energy, and communication companies to enable the Smart Grid. The GreenBus® platform allows for rapid development of utility applications and is the only open source solution that supports interoperability of legacy and new applications. GreenBus was designed to provide a clear pathway for utilities to incrementally adopt smart technology without disrupting the performance of today’s dated, but still reliable grid. At the core of GreenBus is a secure middleware platform that captures extremely high-volume, real-time field device data and interconnects that data with operations and business systems. 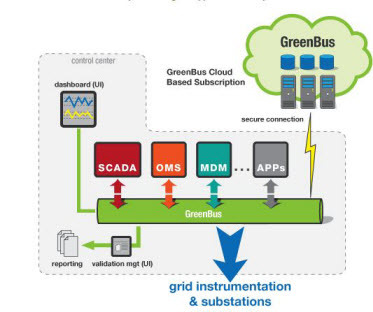 The GreenBus real-time data collection system includes data capture adaptors that are standards-based (DNP3, Modbus and IEC 61850), or customized for hundreds of legacy devices. In July 2011, Green Energy announced that it has been awarded $2,000,000 in American Recovery and Reinvestment Act funding from the Colorado Governor’s Energy Office Revolving Loan Fund that will provide working capital for Green Energy Corp to continue development and marketing of the GreenBus® Smart Grid software platform. Grid Net- San Francisco- Makes open, interoperable, policy-based network management software and 4G wireless communications products for the Smart Grid. Motorola, GE and Grid Net are part of a group of companies looking to bring a WiMax 4G-based smart grid program to Australia. Officials with the companies say the initiative will be the first smart grid based on the WiMax wireless platform. The program includes the installation of smart meters in almost 700,000 households and businesses in Australia by 2013. At the heart of the new joint venture is Qualcomm global smart services, a name for the business Qualcomm took over when it bought nPhase, a pioneer in the business of getting machines to talk to each other over wireless networks, in November 2006. Tropos Networks, Sunnyvale, CA, A long-time municipal WiFi provider which is making a push into networking utility smart grid projects, providing the link between neighborhood smart meter networks and utility "backhaul" networks. In May 2011, Tropos announced new fixed mesh and mobile mesh routers, increasing its line of products that support the 4.9 GHz spectrum. Today, licensed spectrum choices often come with limitations such as narrow spectrum availability and poor performance characteristics. Earlier this year, the Utilities Telecom Council (UTC) proposed changes to the FCC that would make it easier for utilities to utilize the 4.9 GHz band currently allocated for use by public safety agencies. But even without the rule changes proposed, a municipal utility can apply to obtain access to the 4.9 GHz licensed spectrum in their area. In August 2011, Tropos Networks and Taiwan-based Billion Electric Co. announced they will merge their network and communications technologies to provide Asian power utilities with a hybrid smart communications network they say is reliable, scalable and high-performance. Under the terms of the new partnership, Billion will market and support Tropos' secure wide-area network smart grid solution. The offering means utilities can take advantage of Billion's PLC/BPL and Tropos' IEEE 802.11 mesh broadband network technologies to aggregate communications for a variety of smart grid applications like advanced metering, distribution automation, substation security, mobile workforce and more. Also, the Tropos Wi-Fi mesh system can be used as reliable backhaul communications infrastructure for Billion's existing PLC/BPL-based neighborhood communications technologies. Wowww. Good job buddy. All point must be effective to me. Thanks for your good job. It’s very informative and you are obviously very knowledgeable in this area. You have opened my eyes to varying views on this topic with interesting and solid content. Actually I read it yesterday but I had some thoughts about it and today I wanted to read it again because it is very well written.